Glide Foam Twist-In Earplugs feature a unique multi-curved stem that rotates inside a worker’s ear canal for a custom fit. Simply push and twist for Glide to angle its way to the correct fit. 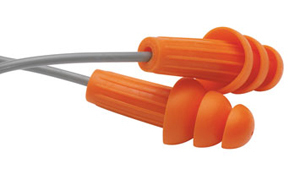 The earplugs also have large handles on curved stems for easy insertion and removal, and a cord that can be attached at any desired length. 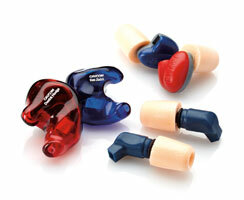 The DM line of universal music plugs were crafted for musicians but can provide hearing protection for many workers. The line offers four color-coded options, each with a different level of strength for protecting the ear against damage from high-decibel sound. All options are universal fit and upgradable. 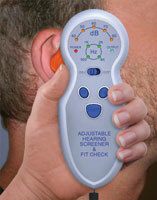 This compact, handheld hearing screener is designed to quickly screen hearing acuity and check the attenuation and fit of hearing protection. It features a fully calibrated pulse tone generator with five decibel levels (40, 50, 60, 70 and 80 dB) and four frequencies (500, 1,000, 2,000 and 4,000 Hz). Testing takes roughly five to seven minutes. Jackson Safety H20 Metal-Detectable Earplugs are designed for use in food processing and pharmaceutical manufacturing applications. Metal is embedded in the earplugs, allowing for easy detection. The H20 earplugs feature thicker stems for easy insertion and removal, three soft flanges that collapse to conform to an individual ear canal, and an orange color for easy compliance monitoring. Peltor X Series earmuffs are available in headband and hard hat-attached versions. With noise reduction rating values ranging from 21 to 31, these earmuffs help reduce exposure to hazardous levels of noise and loud sounds. The earmuffs are lightweight and have soft, wide cushions; foam ear cup inserts; and spacers that help improve attenuation. Ear Set Solutions for radio communication and hearing protection include CavCom, a full two-way “Talk Through Your Ears” system, as well as Radio Gear (shown), a radio-monitoring, listen-only ear set. Available in custom or universal options with noise reduction ratings up to 34, both products adapt to two-way radios for clear communication and comfortable hearing protection. This line of foam earplugs provides an effective single-use solution to combat noise-induced hearing loss. 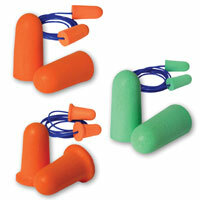 Tested in accordance with ANSI S3.19-1974 standards, these disposable foam earplugs feature soft, slow-recovery foam. They are easy to roll down and insert, and expand slowly for a low-pressure fit in any size ear canal.